League InfoSight and CUBE TV have partnered to bring credit unions the latest information on compliance issues they face. Our in-house Compliance Specialists tackle new topics every month in order to shine light on otherwise confusing regulations. This presentation will provide credit unions with an overview of the compliance changes in mortgage lending. Download the slides for this presentation by clicking here, and don't forget to follow us on Twitter! 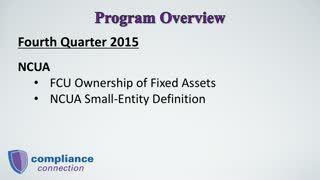 This presentation is a 2014 year-in-review and will provide credit unions with a summary of the compliance items that became effective in 2014. Click here for the presentation handouts, and don't forget to follow us on Twitter! Today we are going to review changes to the Truth in Lending Act and credit card ability to repay requirements. If you'd like a handout on this presentation, just CLICK HERE and don't forget to follow us on Twitter!! This presentation will provide information on a board of director's responsibilities and is presented in conjunction with the board responsibility information that is available for you on Infosite. Join Jody Dabrowski, Credit Union Compliance Consultant as she explains the new requirements for appraisal independence effective April 1, 2011. Jody Dabrowski reviews FACT Act compliance updates taking effect on July 1, 2010. The video covers policies and procedures as well as handling both legitimate and frivolous disputes. James Robert Lay of PTP New Media speaks about the benefits of building effective consumer relationships through the use of social media in this innovative presentation, entitled, "Credit Unions, Coffee & Culture." Jim Todd, regional director with John M. Floyd & Associates, provides a short training video on the regulatory changes to overdraft programs. He walks you through the new Federal Regulations. The Surprise Around The Corner? Marcia Hune, MCUL Director of Legislative Affairs, provides a training video on how credit unions can get involved at the grassroots level. She covers the importance of grassroots lobbying, how to effectively lobby and the opportunities available. Mike DeFors, MCUL Director of Regulatory Affairs, provides a training video about the NCUA Share Insurance Fund, the changes made in the fall of 2008 and new resources available to share the message with your members. CUCorp CU HR Solutions gives an overview of effective disaster recovery planning and response.